My 94 Z28 has been having an issue staying charged for the past year....The issue started after my 383 swap. I relocated my battery to the rear of the car also. I found out that the stereo has came on in the middle of the night, on at least 2 occassions. I turned the stereo to the off position and the issue remains. I can fully charge my battery and 2 weeks later its dead. The mechanic says that there is no CONSTANT draw on the battery. My question is...what would cause a stereo to come on in the middle of the night? I think that whatever does, is the route of my battery drain issue. Also I have a 500/1 JL audio amp and a kicker 10 sub. All the power to the factory system passes through the Retained Accessory Power (RAP) module. Might have a problem with the module relays shorting. On the other hand, if you turn the stereo off with its switch, rather than relying on opening a door to turn it off via the RAP module, the module couldn’t be the issue. 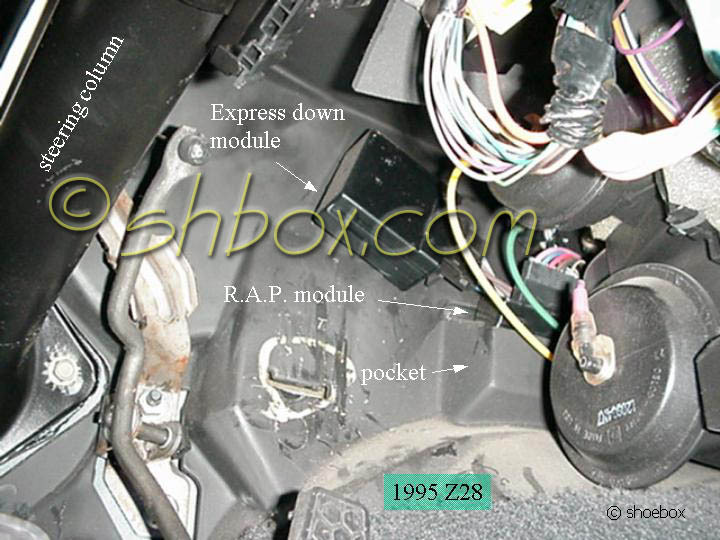 The RAP module also feeds the power windows and the 15-amp “power accessory fuse”. Do you have any of the aftermarket component fed through that fuse? 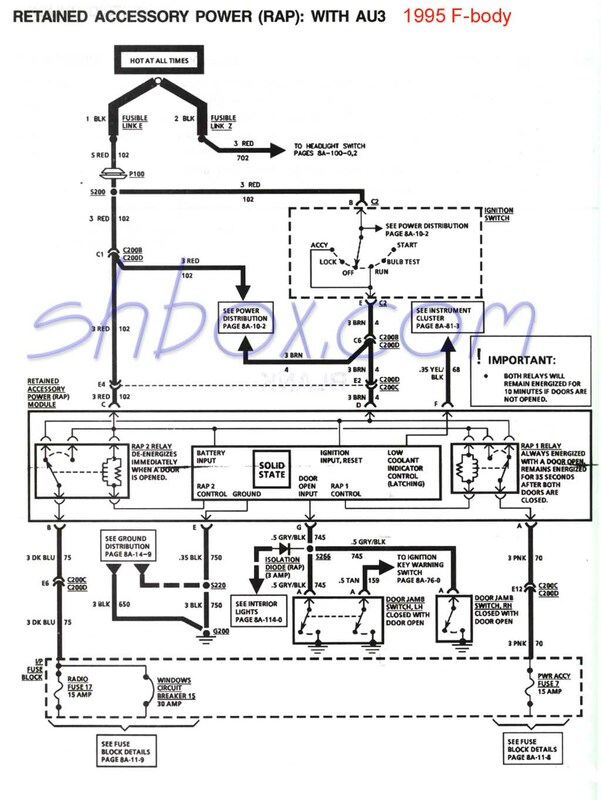 Shoebox has the RAP module wiring diagram. 95 should be the same as 94, although the fuse #’s might be different. Awsome. I have a SS spoiler with 3rd brake light and it is aftermarket. I installed it with instruction that were included. I can hear the relay tick when i press the brake pedal. Thought that was odd.... My head unit is also an aftermarker Alpine unit. The mechanic that completed my 383 install replaced a relay or something under the dash that WAS discharging the battery but he said that once he replaced that relay that there was no furthur drain. 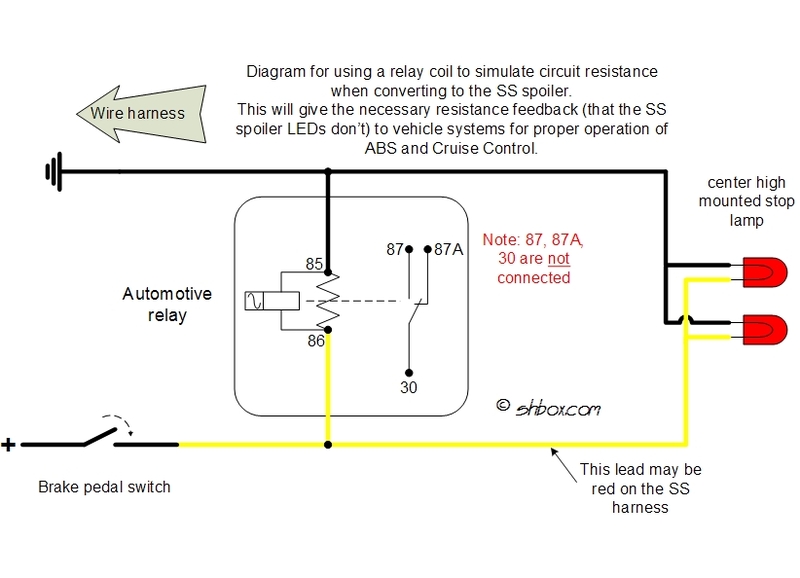 The way the relay is wired into the third brake light, it is normal for the relay to click when the brake pedal turns on the brake lights. It's just there to serve as a parallel resistive load in the circuit. I did use the shoebox ss spoiler diagram. I havnt looked under the dash for the RAP module yet. Im away from the car at the moment. Is the RAP module removalable with removing the dash? Yes. Just rests in the pocket against the firewall. Ok. Yeah i see it now. Does swaping this part require taking the dash apart or is there a way to swap it while leaveing most of the dash together? Is this an AC Delco part? Are you sure you need to replace it? I suggested something that MIGHT be the cause. Have you determined the module is faulty? Do the power windows also work when the radio comes on in the middle of the night? We’re you leaving the radio on, allowing the RAP module to turn it off when a door was opened? Did you turn the radio off before exiting the car to see if that prevented the module from turning on the radio? The fact it turned off with the door opening would seem to tie it into the RAP module. Shoebox's photo was taken by holding the camera under the dash. It should just lift out of the pocket, without taking anything apart. Hard to reach laying on your back, slide driver's seat all the way back. Includes the part #. GM part is expensive. Some sources list it as discontinued. My 383 i have now came from a 94 corevette(4 bolt main block), i used my 94 camaro starter, which does have a few miles. ...would a dead battery be a symptom of a wore out starter? May be cheap insurace to replace since it is older...is a corvette or camaro starter best? I checked the ACDelco starters and apparently the corvette and camero starters have diffrent part #s. Is there advantaages to one over the other? The F-Body and Corvette starters are different. Most likely because of exhaust interfererence issues. My factory starter was replaced at 30K miles under warranty. The factory replacement showed signs of weakness after the 381ci build at ~60K miles. At first I thought an extended started was due to the added load of the stroker, but the shop showed me their measurement of the torque required to turn the new engine was less than the stock engine. Turned out the starter was drawing excessive current, reducing voltage to the point it was affecting the injectors. Years of exposure to the heat of headers had taken its toll. I replaced the factory starter with a CVR Pro-Torque starter. Smaller, more torque. The body of the starter could be rotated to move it away from the headers. Solved the problem.... first touch of the key the 74 #/HR injectors would start the engine instantly. I think JEG'S sells the CVR starter under their name. Probably no more expensive than the Corvette starter. But I don't see how a worn starter would cause excessive current draw with the key in the off position. Last edited by Injuneer; 09-04-2018 at 10:38 AM. Why is the middle to upper middle class hated? 2 years... finally comes to an end tonight... the toy comes home. radio comes on but no sound comes out? Who is the "MR KNOWLAGE" when it comes to factory stereo units? Monsoon or not?